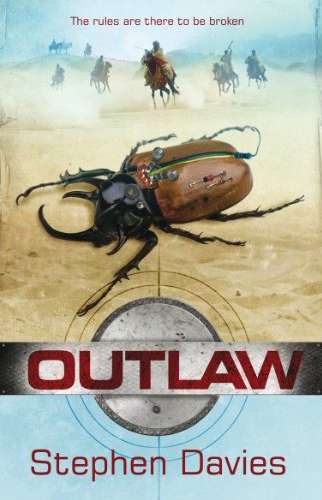 Outlaw goes on sale in a couple of weeks. It’s another book passed on to me by a publisher’s rep a couple of months ago, with a promise that it is an absolutely fantastic boy book. Action, adventure, the whole deal. And, you know, it was pretty good. Davies tells the story of Jake Knight, a fifteen-year-old completely bored with his stuffy British boarding school. To spice up his life he creates urban adventures with his friends – elaborate games of “find the thimble” using GPS and parkour skills to find and hide objects in improbable areas around town. When he breaks into a local prison to retrieve an item, Jake is kicked out of school for the rest of the semester. To his delight, he is sent back to his current family home – in Burkina Faso in West Africa. His dad is the British Ambassador there, and as Jake arrives he fantasizes about the adventures he could have in Africa. Because this is a novel, Jake’s desire is granted with a vengeance – he and his younger sister are kidnapped from an elaborate dinner. They are taken to the desert and find themselves among thieves, terrorists, outlaws, and at the centre of a large military conspiracy. The action is well done. I liked the parkour and building hopping. Technology was well-integrated into the story and rather believable. The evil gold companies and Robin Hood themes running through the story were fun and appealing. The character of Yakuuba Sor, the outlaw they run into, was absolutely fantastic; it is impossible not to fall in love with him a little. The use of African languages and a bit of French added depth, and I so enjoyed all the African proverbs. Finally, I was won over a bit by the fact that this is an honourable book, written by someone who lives in Africa, used actual places and cultures, and who is concerned to educate and inform people about the issues of the region. The simplicity of some of the supporting characters, like Jake’s rather one-note mom. The inconsistent reading level was also frustrating. Except for a shocking bit of violence, Outlaw would be fine for ages 10 or 11 and up; because of that one scene, I wouldn’t want to give it to anyone under 12 or 13, even though the story and writing level is generally pitched younger. Jake’s sister frequently bothered me – I wanted either more or less from her. She obviously had stuff going on (like a crush on Yakuuba, I think), but she came off as rather flat all the same. Overall, a good action-adventure. I would probably recommend buying it in paperback rather than hardcover. But the setting and story combine to make it a relatively unique and fun read, with important enough themes to make it a somewhat thoughtful book.